It’s interesting that the Crossbreed Labs faction from Unstable had a very similar raison d’etre to the Simic from Ravnica, despite being different colors. They do express it mechanically in quite different ways, with the latter having much more of a focus on +1/+1 counters. We haven’t seen any of their cards from the new non-block block, but I’d be surprised if they didn’t have a +1/+1 counter mechanic again. Their original one was, of course, graft, and Cytoplast Root-Kin is a strong example of the mechanic. Even before you get into the fancy stuff, he adds at least four and sometimes much more than four power to your table, and is a decent attacker and blocker even without other cards. The fact that you can return counters to him (albeit at a rapidly scaling mana cost) means that you can salvage something from other creatures that are about to fall in combat or to damage spells. It goes without saying that he interacts well with the additional +1/+1 counter cards that have been printed since 2006, but I’d feel remiss if I didn’t mention another two cards we got in Unstable: Everythingamajig A and By Gnome Means. 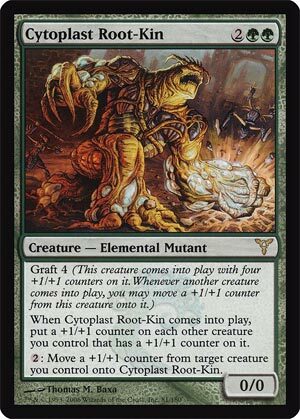 Anywho, Cytoplast Root-Kin plays very well with Graft and, incidentally, the other Simic guild mechanic in Evolve. Giving all of your creatures with +1/+1 counters on them another counter is a good way to keep the party going as their counters start dwindling, and the Root-Kin can take counters away to pass out anew (or try to alpha-strike with them). Unfortunately, that body is a bit on the fragile side; a 4/4 with a proclivity towards shrinking is not going to win many fights, especially without combat keywords. Though it can grow large, so that is a thing! This is definitely a very fun card to fiddle with, and it plays well with small armies you try to grow (so, maybe a better fit alongside Selesnya than with other Simic cards). It’s not good enough for Constructed, but not every card can be.